FILEminimizer Pictures is a free program for the Windows operating system that can reduce the file size of multiple images in one swift operation. 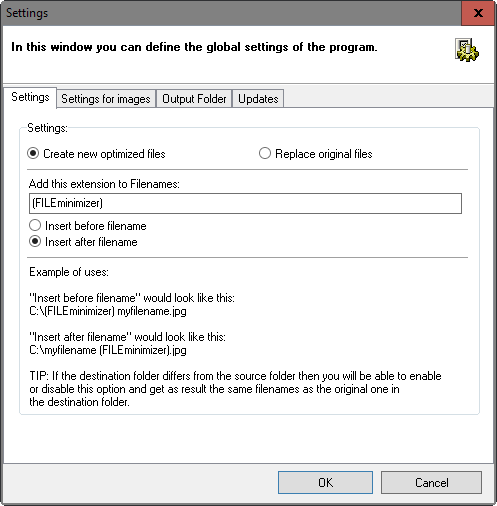 Once a commercial product, FILEminimizer Picture is now available as a free program for Windows that comes with no strings attached. FILEminimizer Pictures compresses images that you select to save up storage space or reduce the time it takes to transfer files on a local network or the Internet. The quality of the image remains the same, more or less. At least, the compressed image is not really distinguishable from the original image when you look at it in an image viewer. The program needs to be installed, but the installer does not hold any unwanted surprises. You may enable or disable the Facebook upload integration, but that is an optional component through and through. Before you start optimizing images, it is recommended to check the configuration first as it lists options to customize the output and program functionality. The program adds FILEMinimizer to files processed by it by default which you can change in there for instance. You may allow the program to change the source image format, or define that the original image format should be kept at all times. None-JPG images, png or bmp for instance, will be turned into jpg images if you don't make the change there. You may also preserve lossless image formats by enabling an option there, and set a custom folder for optimized files. To use the program, simply click on the open files button in the interface and add one or multiple files to it. Each file is listed with its name and size, and a preview pane lists the file names after the compression as well. The program supports three default compression profiles: web / e-mail compression, standard compression, and low / print compression. Instead of using one of the profiles, you may also select custom compression which enables you to select a screen resolution and desired quality directly. For the custom profile users can select a target screen resolution and a quality setting. FILEminimizer Pictures displays the results in a table in the end. The table lists all images that it has optimized as well as their old and new size and the reduction in percent. The image compression software may change the resolution of the original image, which is something that users need to look out for before optimizing the files. The program is very easy to use but lacks customization options that some users may require. It does not reveal the actual settings of the compression profiles that it ships with so that you don't know how good the output quality will be before a scan. It is highly suggested for this reason to let the program create new files in another directory to compare input and output files, and an option to go back to the beginning and create another job in the program. FILEminimizer Pictures is available for download at the developer website. The program is compatible with 32-bit and 64-bit editions of the Windows operating system. I got this initially at a giveaway site. Works great. I haven’t tried this yet, but it sounds like a web designers dream come true. I’m told that the pages on my site take too long to load, This is usually because of images, so I’ve resized them all in photoshop. I’m hoping this will be a great help. Sorry. I’ve just noticed that now, after trying another method. And, i suppose its no big deal really on selecting multiple images. I’ve just been trying to delete my message, as I don’t want others to be put off. Thankfully you replied in the nick of time, so can you please remove my comment. Thanks. Sorry again. I should have taken more time over it. After giving myself more time to evaluate this, I found it an absolutely essential tool for optimizing your websites. Some over creative people tend to forget that while their websites may look and sound great, for visitors, it may be too time consuming to have to wait for your pages to load to actually view it. I use a free web hosting service for my site. In the forum, i asked for the opinions of others, and the most common complaint was how long it took to load. Someone suggested using photoshop to “save images for web”, which I did. This sped things up, altho, it meant having to go through each image individually. Then, I came across this piece of magic. It reduced file size even more. Quality was still great, so no sacrifices were made. It’s all very well resizing images physically on your pages. However, that just takes care of formating. The original size stays the same. That’s when FileMinimizer Pictures comes in really handy. You won’t be able to optimise images any better than this. It even challenges PhotoShop.